Its olive green has been a desired stone since 1500 B.C and deeply connected with ancient Egypt, this gemstone is known as the “Evening Emerald”. 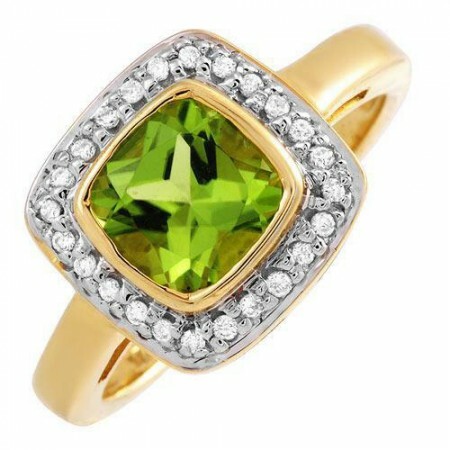 Peridot is gem-quality olivine and is one of the few gemstones that occur in only one colour, an olive green. The intensity and tint of the green, however, vary from yellow to olive to brownish-green. The most valued colour is a dark olive-green. Peridot is one of the oldest known gemstones, with ancient written records documenting the mining of peridot as early as 1500 B.C. It is a gem especially connected with ancient Egypt, and some historians believe that the famous emeralds of Cleopatra were actually peridots. The Smithsonian Institution in Washington DC has a cut peridot stone of 310 carats. The Romans called peridot “evening emerald,” since its green colour did not darken at night but was still visible by lamplight. It is the birthstone for August.